Surprisingly (or not) I have very little recollection of that trip. I remember Space Mountain, the Pina Coladas, dry vodka martinis and that it was exceedingly hot and humid. So humid, that pair of swimming trunks left on the balcony wouldn't dry. I swear there was frost around the air-conditioning vent. And the only souvenir I have is a swizzle stick from the Contemporary Hotel. That might explain why I don't remember a lot of that trip. The four main things I do remember (and left a lasting impression on me), was the heat, humidity, expense and crowds. In March 2000, I was going to be in Orlando on business. (Actually, I'd be at a hotel on International Drive, right next to the Orange County Convention Center.) Coincidentally, a couple of people I knew from Chicago were going to be at a reunion of sorts in Tampa the week before, and there was a three day gap between their reunion ending and my conference starting. Hmmm... What to do... Since we were going to be in the neighborhood, how about Walt Disney World! By this time I had already stopped flying, and was going to turn the conference into a Road Trip anyway, spending a few days taking one route to Orlando, and another on the way home. Adding in a few extra days wouldn't be a problem. It was a perfect storm to get me to the theme parks. And thus, I booked a room on US-192. We'd do Disney World in three days. All the planning was left to the people I'd be there with. My two previous experiences with Disney Parks, Disneyland in 1969 and Magic Kingdom in 1977 (which was nothing more than an extravagant copy of Disneyland) left me a little cynical about what I was going to see. As I look back, I can't honestly say what I expected in March 2000, but it was more negative than positive. Mediocre to bad (and expensive) food, and an environment more suited for kids. I mean, it was Disney, right? Well, the cynical side of me was wrong. Disney is after your money, but they're doing it in more subtle ways than just charging you more for everything. For instance, very attractive (relatively speaking) vacation package prices, including options such as food credits, which allows families to prepay the majority of their vacation. Knowing what the vacation is going to cost upfront makes the decision making much easier. Souvenirs, extra of course. Disney even solves the problem of having to get to and from the airport to one of their resorts by providing "free" bus and luggage transportation. As a matter of fact, the family doesn't even have to touch their luggage at the Orlando Airport, it is automatically routed to their resort by special luggage tags sent to you by Disney. Disney will also provide a free and (usually) efficient resort to park to resort transportation system. How does that make sense? Volume, to the tune of 50 million visitors per year and almost 30,000 rooms on Disney World property. In addition, this essentially keeps you captive on on-site for your entire trip, and almost all the dollars you spend is with Disney. However, in Disney's defense, Disney makes sure there's very little reason to leave their property, even if you're staying off-site and just visiting the parks. Then a friend of mine who had moved to Tampa several years before, drove down to Orlando one night and we went into Epcot. I was amazed at the change of character the park had at night. It also introduced me to Disney Fireworks, Illuminations 2000, Reflections of Earth (the new nighttime show in Epcot at the time) truly took my breath away, with a moving score and (almost) perfectly timed visual effects. Well, like anything else that interests me, I started investigating Disney World. This was a lot harder than one might imagine today, but in the Web's infancy, detailed information was still hard to come by. Most of it just came in the form of a printed word, rather than electronic bits. Addiction. It's a terrible thing. An increasing number of trips lately have been to attend a D23 event. (D23 is Disney's official fan club and directly supports the Disney Archives.) These events have given me access to Disney Legends, the Cinderella Castle Dream Suite, dinner in Great Movie Ride and a number of backstage tours; as well as the history of Walt Disney World at the 40th anniversary event, and even more detail at Epcot's 30th anniversary event. All of these events have been documented in my Trip Reports. Let's face it. Walt Disney World has been in existence for over four decades now (Disneyland almost six), and is still the most attended vacation destination in the world, perennially takes four of the top five theme park attendance spots in America (Disneyland rounds out the top five) according to those who keep records. Before we can talk about Walt Disney World, we should probably talk about what Disney World was supposed to be. Walt Disney's vision of his "Florida Project" (or "Project X") was quite different than what we have today. Walt wasn't really concerned about creating a "Vacation Destination" as it currently exists. Walt's plans went far beyond just theme parks. He wanted a city. He wanted an Experimental Prototype Community of Tomorrow. So right outside his park, were seedy motels, neon signs and other venues that he didn't like, and didn't want to have associated with the Disney name. Even to this day, while the Disney Company has acquired more of the land around Disneyland, there are still tall walls around some of the areas to block the view of the buildings right across the street. (Of course, tall walls at Disney are themed walls...) I think it's one of the things that make the California parks seem more claustrophobic to me than the Florida parks. But something caused his plans to change, something expanded his vision beyond just an East Coast theme park. If I had to guess, it was the 1964 World's Fair. He still wanted to build his new park where he had the land to expand and control the surroundings, but he wanted something more. He wanted a city. Or more precisely, a City of Tomorrow. Walt's vision of the ultimate planned community. With the phenomenal success of Disneyland, his attractions at the World's Fair and successes in other areas, such as the movie Mary Poppins, Walt Disney by 1964 was a very hot property. He knew what would happen if word got out that he was going to buy a lot of real estate, the price of the land would escalate out of control. So he set up seven dummy corporations and bought some 43 square miles of swampland (well, some of it, well, a lot of it) for five million dollars before the newspaper figured it out. Within days, the value of the land around the property increased in value five-and-a-half times, from around $180 to $1000 an acre. Walt suggests that we begin referring to our town of tomorrow plan as EPC - Experimental Prototype Community - which very nicely puts the thought across. He would build the theme park resort first, his Disneyland "done right" (or at least, "themed more efficiently"), and use the profits (not to mention corporate sponsorships) to build his Experimental Prototype Community Of Tomorrow. Of course, Walt's dream of a city was never realized after his death. 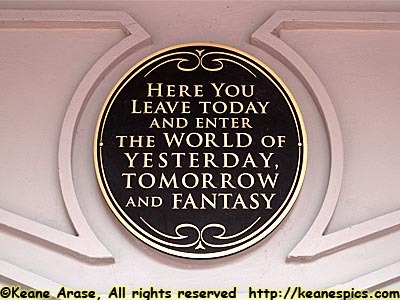 It's a place that only exists in films and books, the Disney Archives, and maybe the People Mover in Magic Kingdom. Had Walt lived, I think my narrative from here forward, would have looked much different. There's a lot more information about all of this in my May 2011 trip report, where I attended D23's Walt Disney World's 40th Anniversary Event, and my September 2012 trip report, where I attended D23's Epcot's 30th Anniversary Event. Not only did D23 and Imagineering relate a lot of historical information about the building of the parks, but quite a few of the prototypes and proposals that never made it, by the very people that built and maintain Walt Disney World. Much of this information is also being written into the individual theme park pages on this site. Walt may have been an inventor, entrepreneur and visionary, but if he had any serious problem, it was the lack of an heir apparent. He gave directions personally to his teams, and personally oversaw his movies and other endeavors. So when he died on December 15, 1966, he left a void at the company that would have sunk it had it not had its prior successes. The creativeness was still there (it's not like WED and his animators died with Walt), but it lacked the focus and direction of Walt Disney. (Not to mention the charisma it took to seek venture capital, to be honest.) You can complain about the bureaucracies of some of the decision making today, but much of it was done so the loss of one person wouldn't cause the company to come to a complete halt. I think the biggest casualty of Walt's death (if you look at the different assets within the company), was Disney World. The company had only acquired the land a year before, and everything was in its infancy and planning stages. Marty Sklar (now retired), who I think was probably Walt's spiritual (if not actual) successor in Imagineering's Theme Park business, said succinctly, "And then the Disney world we knew imploded." There was no one else in the company that had the charisma and entrepreneurship of Walt, who could raise the capital and have the will to create his plan. The plans for Disney World were put in a box. Roy O. Disney said it was so far beyond the scope of what the company did, that he couldn't even comprehend it. The Board of Directors decided it wasn't in the best interest of the company to try to run a city. Of course, more than a few of Walt's decisions probably weren't in the best interest of the company, but it's hard to argue with the Board's decision when you look at the world-wide multi-media corporation the Disney Company has become. At the entrance to Magic Kingdom. But in 1967, the company still had 43 square miles of undeveloped land in Florida. 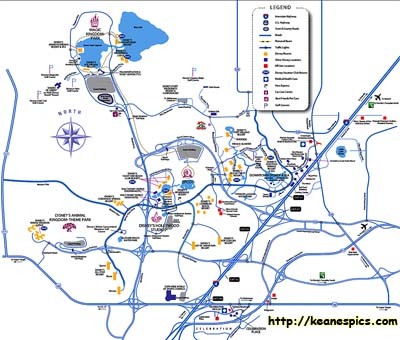 By 1968 the company had the Florida Supreme Court pretty much confirm that the Reedy Creek Improvement District (the governing body that oversees Walt Disney World's land) was an entity unto itself, and could do whatever it wanted within its borders. Rumor has it they could have even built a nuclear reactor on-site. Since the theme park and hotels were part of the first phase of the Florida project, they were already semi-planned, and their locations were determined even in the early sketches above. Soon after the establishment of the Reedy Creek Improvement District (or RCID), swamps were drained and construction began. On January 16, 1970, Disney opened a Preview Center, a place where the public could go and see what the Mouse was up to. 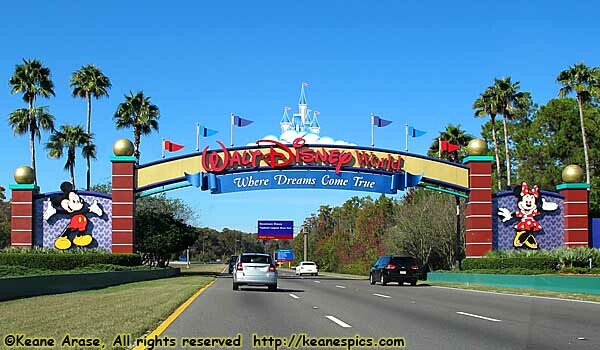 It closed on October 1, 1971, the day Walt Disney World officially opened. ("Walt" was added by Roy as a tribute to his brother.) It consisted of Magic Kingdom, the Contemporary Hotel and the Polynesian Resort, all connected by monorail and boat to the Ticket and Transportation Center, where you parked your car and left "today" behind, and entered the world of Yesterday, Tomorrow, and Fantasy. In 1974, Marty Sklar (the new creative leader at Imagineering) got a call from Card Walker (CEO of Disney at the time) who asked, "What are we going do about EPCOT?" Epcot Center (and later just Epcot), half technology showcase and half World's Fair, opened on October 1, 1982. In 1984, Michael Eisner is hired as Disney's CEO. He's seen the plans for Universal Studios Florida (now Universal Orlando) in a former job, and Disney-MGM Studios (now Disney's Hollywood Studios) opens on May 1, 1989, a year before Universal. In 1990, Eisner declares the Disney Decade, and on April 22, 1998 Animal Kingdom officially opens. The four theme park icons. A shopping district, Downtown Disney, with a soon to be renovated nightclub district called The Springs. Two water parks, Blizzard Beach and Typhoon Lagoon. Two miniature golf courses, Fantasia Gardens and Winter Summerland. Five real golf courses, Oak Trail, Magnolia, Palm, Osprey and Lake Buena Vista. A complete sports and training complex, ESPN Wide World of Sports. A campground, Fort Wilderness, with 800 campsites and 400 cabins. A residential home area, Golden Oaks, with around 400 homes. In the end, Walt Disney World isn't the Disney World Walt imagined it would be. Would he have been disappointed? Perhaps. I'm sure he would have been in the early 80's when another theme park, even as grandiose and ambitious as it was, replaced the city of his dreams. But if Walt could see his Florida Project today, I'm sure he'd be amazed to see what his company has accomplished. The Disney Company has built a vacation destination with a population (albeit a transient population) bigger than most cities in America, with an infrastructure larger than those cities to support it, including water, sewage, garbage disposal, transportation and power. It's somewhat staggering to think of what it takes to supply and maintain things like food services; complete hotel operations for 26 hotels; the vast bus, boat and monorail transportation system; plus four major theme parks with dozens of different attractions. So no, the Disney Company didn't build Walt's City of Tomorrow, but his successors did build a city, where buses and boats replaced monorails and peoplemovers, theme parks replaced industry and hotels replaced residences, all to the tune of some 51 million guests entering the parks per year. So even if Walt was disappointed in what Walt Disney World has become, he most certainly would have approved of the success his East coast resort has had for the past 40 years. After all, Walt thought the ultimate praise was how well the audience liked your work. Enough history. But I do think one has to have some sort of perspective of how Walt Disney World evolved, why it's the size it is and why Disney seemed to have the forethought to buy 43 (now 38) square miles of land. But let's move on to other things. These numbers include Disneyland and California Adventure, as well as the three hotels at Disneyland Resort. Domestic/International is as granular as I can get. Note 1: Per Room Guest Spending: Includes hotel room, plus any spending at the hotels, per day. These numbers include Disney Vacation Club rentals. Finally, I have to plug a couple of outstanding books on how all of the parks were put together, by the two of the Disney Legends that actually put them together. The first is Dream It! Do It! by Marty Sklar. 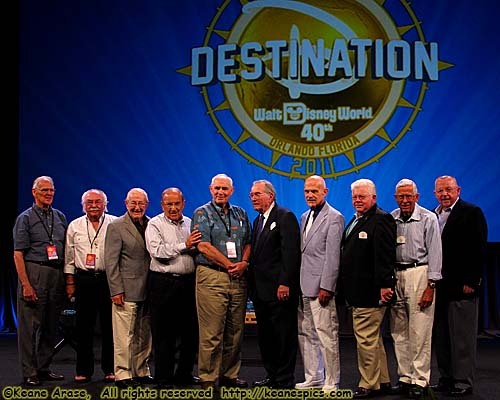 Marty's had more than his hand in the creation of all the Walt Disney World theme parks. You'll also find that early in his career he was the main ghost writer of Disney's press releases and promotional films, so his story goes far beyond just being the head of Imagineering. But there's a lot of information about the creation of the parks in this book. You may also want to check out the two Imagineering books, oversized coffee-table sized tomes full of Disney Eye Candy, as well as a look at what Imagineering actually does. They are Walt Disney Imagineering: A Behind the Dreams Look At Making the Magic Real and Walt Disney Imagineering: A Behind the Dreams Look at Making More Magic Real. They're both beautifully done books. End Walt Disney World (overview) - Part 1 of 3.